Born at Clunes in Victoria in 1869, Alfred lived and worked in Charlton and Bairnsdale in Victoria before moving to Western Australia around the turn of the century. He married Alice McLeod in Perth in 1898. We think Alice was born at York in Western Australia in 1871, the daughter of Scottish-born George McLeod (1836-1917) and Irish-born Annie Foley or Folley (1843-1914). George and Annie, pictured on the left in around 1910 with her granddaughter Mabel Toms, were married in Perth in 1863 and had seven children in addition to Alice: George (born in 1865), James (1873), David (1879), Janet (1881), Marrian (1882), Christina (1884) and Isabella Agnes McLeod (1887). The family moved to Katanning in the Western Australian wheat belt in the early 1880s. George died there in 1917 and Annie in 1914. Her death notice, published in Perth's Western Mail, read: 'Mrs George McLeod, senr, who came to Katanning with her husband and family 23 years ago, passed away on Friday Hight, in her 74th year, leaving a husband, four daughters, and three sons. The funeral on Sunday in the Roman Catholic portion of the Katanning Cemetery was largely attended. Rev. Father Reidy read the service' (13 March 1914). The Australian electoral rolls show that, at the time of the 1903 and 1906 elections, Alfred and Alice were at Kookynie in the Coolgardie District of Western Australia where Alfred was working as a miner. Some time after this they moved to Perth where Alice died on 4 December 1913 following a long and painful illness. Her funeral notice, published in the Perth Daily News, read: 'The funeral of the late Mrs Alice Hickmott, wife of Mr Alfred Hickmott of 33 Charles Street West Perth, took place on Friday afternoon last in the Methodist portion of the Karrakatta cemetery and was very largely attended by many relatives and friends of deceased. The chief mourners were: Mr Alfred Hickmott (husband), Master George Hickmott (son), Misses Marion and Louisa Hickmott (daughters), George McLeod and James McLeod (brothers), Mrs H. Budd, Mrs G. Seth and Mrs G. Rogers (sisters), Mr H. Budd and Mr G. Seth (brothers-in-law)' (8 December 1913). Alice was buried in the Wesleyan section of the Karrakatta Cemetery (section DA, gravesite 0186A). The 1916 electoral roll has Alfred, then a horse driver, living on Queensberry Street in West Perth. At the time of the 1925 election he was registered as living at 492 Newcastle Street in Balkatta (along with his son George Henry Hickmott). The 1931 roll has Alfred at 214 Park Street in Subiaco along with an Alfred David 'Hickmore', shop assistant, and Janet Harriot Hickmott, factory hand. Only Alfred and Alfred David were registered there in 1936 and Alfred only was registered there in 1937 and 1943. The 1949 roll has Alfred still at 214 Park Street (Alfred David Hickmott, a commercial traveller, was living at 104 Onslow Road in Subiaco). Alfred died at Subiaco on 13 September 1956 and is buried with his wife in the Karakatta Cemetery. Alfred and Alice had six children we know of: Marion Alice, George Henry, Annie Louisa, Christina May, Janet Harriet and Alfred David Hickmott. Born in Canning in Western Australia, Marion married Fred Laney (1898-1957) in Perth in 1920. Fred, pictured on the right, was born in the Melbourne suburb of Braybrook in 1898. His parents were Glamorgan-born John Laney (1855-1931) and Mary Ann Andrews (1859-1934) who was born near Castlemaine in Victoria. They were married in Victoria in 1887 and, according to the 'My Laney Tree' on Ancestry, had eight children in addition to Fred: John William (born and died in Melbourne in 1888), Millie (1890-1952), Alice (1892-1990), John known as 'Jack' (1894-1943), Mary (1896-7), Mary (1897- ), Ethel (1900-89) and Florence Laney (1904-4). John's death notice, published in the Perth Sunday Times on 15 March 1931, informs us that before emigrating to Australia, John Laney snr had served in the Royal Navy including on the ironclad HMS Sultan during the Egyptian campaign: 'LANEY - The Friends of the late Mr. John Laney, of 227 Oxford Street, Leederville, formerly of the W.A.G.R. Perth, and A.B. of H.M.S. Sultan, bombardment of Alexandria, 1882, are respectfully requested to follow his remains to the place of interment, the Methodist portion of the Karrakatta Cemetery. The Funeral is appointed to leave his late residence 227 Oxford Street, Leederville, at 11 am TOMORROW (Monday) AFTERNOON. Friends wishing to attend the Funeral may proceed by the train leaving Perth at 11.5 am'. A second notice, published in The West Australian two days later, informs us of John and mary Ann's then surviving children: 'LANEY - On March 14, 1931, at the Perth Hospital, John, the dearly beloved husband of Mary Ann Laney, fond father of Millie (Mrs. Mullane), Alice (Mrs. Stanton), Jack, Fred, and Ethel (Mrs. Evenis); aged 77 years. His military record in the National Archives in Canberra tells us that the 18 year-old Fred Laney, a hairdresser by trade, enlisted in the First AIF at Perth on 23 February 1916. His NOK was his father, John Laney, of 17 Oxford Street Leederville. He was allocated to the 28th Battalion and left Australia on the Miltiades on 7 August 1916. After undergoing training at Etaples, he joined his battalion in France on 9 January 1917 and was wounded in action (a GSW to the face) on 23 March of the same year. After spending time recuperating at Dartford in England, he returned to France in November 1917 and was wounded in action again on 10 June 1918 (GSW to the chest) and invalided to the Bath War Hospital. Fred was wounded for a a third time (GSW to the foot) on 11 August 1918 and again invalided to England. He returned to Australia on the Takada on 24 December 1918 and discharged at 5 MD on 1 January 1920. 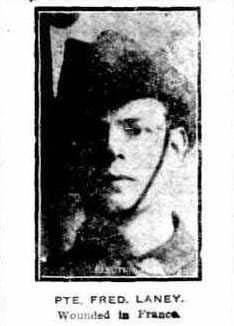 Fred's older brother, Jack Laney who was then working as a law clerk, had enlisted in Perth a week before Fred. Allocated to the Australian Medical Corps he also sailed on the Miltiades. He went to France on 22 August 1917 where he served as a corporal in the 3rd Australian General Hospital. After spending time in hospital in England recovering from a bout of pneumonia he returned to Australia on the Yperinga in November 1919 and was discharged from the Army in Perth on 21 February 1920. Jack married Bertha Marjorie Abrahams (1897-1983) there later that year and died in Perth in 1943. He and Bertha had at least two children: Betty and Bertha Merle Laney (who served in the Royal Australian Air Force during the Second World War). Bound for America. The war brought much happiness to many Australian girls who met and fell in love with servicemen from overseas, but for their parents it often brought sorrow because they had to be separated from children who left their homes to live in other countries. Mrs. Fred Laney, of Park-road, Subiaco, knows just how it feels to have two young daughters thousands of miles across the seas, for her two eldest married American servicemen and have been living in the United States for five years. In that time they have had children and learnt to live the American way of life, while their family at home in W.A. have had to be content with photographs and "snaps" to keep visually in touch with them. Getting to America is no easy job these days and it has taken much organisation, both in the United States and here, for a passage on the Aorangi, which will soon take Mrs. Laney to her daughters. She has been waiting for more than 12 months for accommodation on the ship. She will fly from Perth to Melbourne on Saturday and after a few days in that city will go on to Sydney, where she will embark on her long voyage. Her first stop will be Vancouver and she will then travel to Los Angeles, where her eldest daughter, Marjory (now Mrs. Michael Fennell) and her husband, will meet her and intro- duce her grandson Michael junior, and then take her overland to Phoenix, where Mrs. Laney will stay with the Fennells for a number of months. After this visit she will journey to the other side of the continent and stay with her daughter Edna (now Mrs. Bill Horton), who lives in Rochester, New York. Edna has two young children - Barbara and Judson - to introduce to their grandmother. After Mrs. Laney has stayed there for several months she will travel back to Vancouver, and then home. The two Laney girls left Australia together in December, 1944 - they were married in Perth while their husbands were stationed with the U.S. forces here - but, because of the great distance between their homes, have not seen each other since they landed in America. Both are fortunate in having modern houses with ample accommodation for their welcome visitor (Western Mail, 21 April 1949). 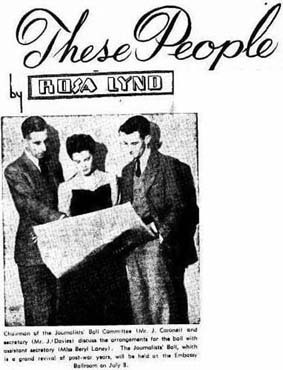 The 1949 electoral roll shows Marion back at Subiaco with Fred and a younger daughter, Beryl Mavis Laney, who worked as a journalist for the The Daily News. Fred died at Subiaco in December 1957. He was cremated and his ashes 'scattered to the winds at Karrakatta cemetery' where he is memorialised in the crematorium rose gardens. After Fred's death, Marion moved away from Subiaco and lived first at Salter Hill in South Perth - where she worked as a 'spotter' - and then with her son, Frederick George Laney and his family, at Kallaroo. The Southern Metropolitan Cemeteries Trust website shows that a Marion Alice Laney was cremated at the Springvale Botanical Crematorium in Melbourne on 16 March 1982 (no other details provided). We don't know whether she had moved to Melbourne or died there during a visit. Marion and Fred had four children - Margaret Helen, Frederick George, Edna Marion and Beryl Mavis Laney - and at least six grandchildren we know of. As we have seen, their two eldest daughters went to live in the United States after their respective marriages in Perth in 1944. Margaret had one child we know of - Michael Fennell who was born in California in 1946 - while Edna had at least two children: Barbara and Judson Horton. The 'My Laney Family' tree on Ancestry tells us that Edna died at Pinetop in Arizona in 2008 and her husband, William Edward Horton, died in Dallas Texas in 2014. The WA Reverse Marriages index indicates that Marion and Fred's youngest daughter, Beryl Mavis Laney, married Donald Ernest Mack in Perth in 1951. The Australian electoral roll has Beryl and Donald, a bookmaker, living at Mount Hawthorn in Western Australia in 1954. The 1958 roll shows Beryl, who was working as a journalist, living by herself in the Melbourne suburb of South Yarra. Not long after this Beryl divorced Mack and married a fellow journalist and two times widower, Neil Armstrong Town (1909-2004). The Department of Veterans' Affairs nominal roll for the Second World War shows that 20551 Neil Armstrong Town enlisted in the RAAF at Cambden in NSW on 16 December 1940. He had been born at Bendigo in Victoria on 3 February 1909 and gave as his NOK his then wife Meryla Town (Meryla Iris Jaques who he married in 1939 and who died ten years later). Neil was discharged from the Air Force on 1 July 1947 while serving as a Flight Lieutenant with the Central Flying School. He had been awarded the Air Force Cross at Admiralty House in Sydney on 23 June 1944. According to a report in the Melbourne Argus dated 22 January 1943: 'Pilot-Officer Town, who enlisted in the RAAF in 1940, was posted to No 8 Elementary Flying Training School as instructor. Despite the monotonous nature of his duties, his record is one of conspicuous and unremitting service, and he has set an example of diligence and efficiency to all pilots. Pilot-Officer Town was keenly interested in aviation for several years before the war, and obtained his civil pilot's licence. Before enlisting he was a member of The Argus photographic staff, and was a brilliant press photographer. Many of the most spectacular photographs of bush fires and floods published in The Argus were taken by Town'. The Australian electoral rolls has them living at Montrose between 1963 and 1980. The Melbourne General Cemetery listing shows that Beryl was cremated at the Springvale Botanical Cemetery on 1 November 1984 (no further details given). The Ryerson Index tells us Neil died on 16 September 2004. We don't think they had any children. Born in Perth, Frederick George Laney (1923-92) served as an Able Seaman in the Royal Australian Navy between 1941 and 1946 and married Olive Lorna May (1925-2012) soon after he was discharged from the Navy. The Australian electoral rolls show that Fred worked as a commercial traveller, store manager and company director and he and Olive lived at Bunbury, Albany, Kalgoorlie and Perth. Fred died at Albany in 1992, was cremated and his ashes collected by the administrator of the Karrakatta Cemetery. The Perth Metropolitan Cemeteries Board shows that Olive, aged 87 years, died at Mullaloo (a northern Perth suburb) on 22 September 2012. She was cremated and her ashes were also 'taken by administrator at Karrakatta cemetery'. Her obituary, published in the West Australian on 24 September 2012 reads in part: Wife of Frederick (dec), loving mother of Gail, Bev and John. Proud Nana of Heath, Adrian, Kelly, Danae and Laney. Great grandmother of 9 and also loving friend of George'. with two of her journalist colleagues. It was published in the Perth Western Mail in 1946. Born at Tampa in Western Australia in 1901, George was living at Fremantle and working as a saddler at the time of the 1925 election. As announced in The West Australian on 22 February 1929 he married a local girl, Ruth Manderson Pearce Davies (1905-99): 'HICKMOTT-DAVIES. On January 23, at St Alban's Church Highgate, by Rev. Archdeacon Hudleston, George Henry, eldest son of Mr and the late Mrs A. Hickmott, of 214 Park Street Subiaco, to Ruth Manderson, younger daughter of Mr and Mrs Cyrus Davies, of 93 Second Avenue Mt Lawley'. Cyrus' death notice indicates Ruth had five siblings: 'DAVIES. In loving memory of our dear husband and father. Cyrus. who died April 29 1946. Beloved husband of Ruth. fond father of Stella (deceased), Charles. Edna. Ruth, Aubrey and Jim: father-in-law of Chappie Menagh and George Hickmott and Violet Davies. Dear Dadda of Cyrus. Stells and Norma Menaegh Marion and Edna Davies and Ruth Alice Hickmott' (The West Australian, Tuesday 29 April 1947). The Australian electoral rolls show that after their marriage George, who now worked for the Western Australian railways, and Ruth lived at 76 Second Avenue in the Perth suburb of Maylands until at least the 1980s. The 1963 roll has a Ruth Alice Hickmott, secretary, also living at 76 Second Avenue. The WA Metropolitan Cemeteries' Board website records that both George and his wife Ruth died at Mount Lawley in Western Australia, he in 1980 and she, aged 94 years, in 1999. George and Ruth had at least one child we are aware of, Ruth Alice Hickmott who was born in Perth on 2 May 1942. The Western Australia Marriage Index contained on the'findmypast' website tells us she married Raymond Donald Yates in Perth in 1963. The Australian electoral rolls show that Ruth and Raymond, who worked as a fitter, lived in the Perth suburb of Dianella until at least the 1980s. The Perth Metropolitan Cemeteries index tells us a Raymond Donald Yates of Dianella died in 1998 aged 59 years. He was cremated at the Karakatta cemetery and is memorialised in the cemetery's gardens. Born at Kookynie in Western Australia in 1903, Louisa married Robert Charles Roy (1903-68) in Perth in 1926. Robert was born at Mannum on the Murray River in South Australia. His parents were James Watt Roy (1868-1940) and Bertha Alvina or Alwine Kuhn (1878-1950) who were married at Wellington in South Australia in 1901 and divorced in 1930. The Australian electoral rolls show that Louisa and Robert moved to Melbourne sometime after their marriage. They were living at Preston in 1937 and Footscray in 1940 when Robert enlisted in the 2nd AIF at Caulfield. He served as a private soldier in the 2/9 Field Ambulance and was discharged in August 1942. They continued to live in Melbourne after the war initially in Richmond, then Hawthorn and then in Kew (during this time Robert worked as a newsagent and shopkeeper). In the 1960s they returned to Hawthorn where Robert died in 1968. He was cremated at the Springvale Botanical Cemetery and is commemorated on their Banksia Wall (AB/60). Louisa continued to live for a time in Melbourne before returning to Western Australia where she died, aged 90 years, at Nedlands on 9 September 1993. She was cremated and her ashes dispersed at Karrakatta Cemetery. We don't think she and Robert had any children although that has not been confirmed. 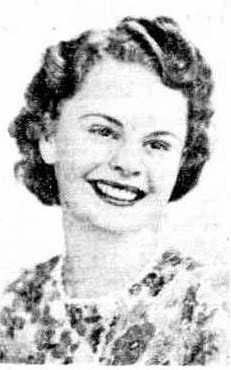 Born at Kookynie in 1905, Christina moved to Melbourne sometime before 1933 when she married Bruce Ray Overbeck (1914-1967). Bruce was born in the Melbourne suburb of Prahran in 1914, the son of Charles Augustus Overbeck (1973-1953) and Caroline Sophie Louise Helena Hoffmann (1888-1976) who were married at Toowoomba in Queensland in 1910 and had at least two other children in addition to Bruce. The Australian electoral rolls show a Christina May Overbeck, waitress, living at 7 Porter Street in Prahran in 1934, 1935 and 1936 (when she and Bruce were also registered at his parents' residence at 20 Porter Street Prahran). They were both still at 20 Porter Street in 1937. The Department of Veterans Affairs' website shows VX53597 Signalman Bruce Ray Overbeck enlisted in the Army at Royal Park in Melbourne on 18 April 1941. He was then living in the Melbourne suburb of Windsor and gave as his NOK Charles Overbeck. He was discharged on 20 February 1946 while serving with the 2/12 Field Regiment. The 1943 and 1949 rolls have Christina, home duties, at 178 Victoria Parade in Melbourne. She then disappears from the roll. By 1949 Bruce had moved to Sydney where he continued to live and work as a baker until his death there in 1967. We have been unable to trace Christina after 1949, nor do we know if she and Bruce had any children. 5. Janet Harriet Hickmott (1907-93). Born in 1907 Janet was living with her father and was employed as a factory worker at the time of the 1931 election. Two years later she married a tobacconist, and sometime s p bookie, Thomas Higgins (1904-80). Thomas was the son of Ballarat-born Robert Colquhuon Higgins (1867-1939) and Elizabeth Harwood (1870-1959) who were married in the inner Melbourne suburb of Fitzroy in 1889 and later moved to Perth. The Australian electoral rolls show that Thomas and Janet lived in Perth all their married lives. He died in the suburb of Bayswater in 1980, she in Maylands in 1993. Both are buried in the Higgins family plot in the Karrakatta Cemetery in Perth. We don't know if they had any children. 6. Alfred David Hickmott (1909-78). Alfred was born in 1909 and married Oriel Ethel Walkington (1912-88) on 22 September 1934 at St George's Cathedral in Perth. Oriel was said in the newspaper announcement of the wedding to be the twin daughter of Mrs Alma Whitewood of Aberdeen Street Perth. The 'Walkington Family Tree' on the internet states that Oriel was born at Manly in NSW on 1 July 1912, the daughter of Arthur Ernest Walkington (1878-1912) and Susan Alma McCaffrey. It adds that she had three siblings: Audrey, Raymond and Thurley Margaret Walkington. Oriel's brother, Raymond (who was born as Cairns Raymond Walkington) was killed in an accident in Egypt during the Second World War. Born at Cairns in 1908, he enlisted at Claremont in WA on 10 August 1940 and died on 14 May 1941 while serving as a signalman with the 7 Div Signals Company. He is buried in the El Alamein War Cemetery. An article in Perth's Daily News tells us Raymond 'was educated at Perth Boys' School . . . [and] for the two years before enlisting, helped his mother . . . in business at Margaret River. He was not married and his main hobby was fishing'. After their marriage the couple lived initially at Kalgoorlie where they had two children we are aware of: Maureen Thurley Hickmott (1935-37) and Keith Alfred Arthur Hickmott (born in 1937). Alfred, or 'Alf' as he was called, was then working as a commercial traveller. The Second World War nominal roll shows WX21512 LCpl Alfred David Hickmott, who was born at Merridin in Western Australia on 16 October 1908, enlisted in the Army at Claremont on 8 April 1942. His NOK was Oriel Hickmott. He was discharged from the Army on 6 September 1945 while serving with 6 Aust Inf TPS Wksp. The electoral rolls have them registered as living at Kalgoorlie in 1949, Wembley near Leederville in 1954, Boddington in 1958, Nollamara in 1963 and 1968 and then Mandurah. During this time Alfred worked as a traveller, storekeeper and salesman. The Perth Metropolitan Cemeteries Board shows that Alfred died at Mandurah in 1978 and Oriel in 1988. They are buried in the family grave in the Wesleyan section of Karrakatta Cemetery along with their son, Keith, who died in Greenwich in NSW in 1963. 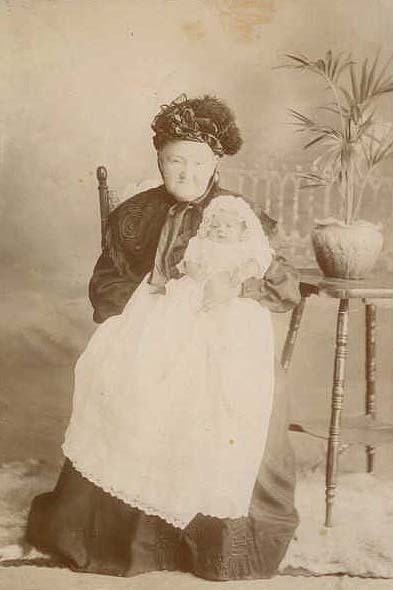 'Annie Foley nursing Mabel Toms', taken from the 'Johnson Family Tree' on Ancestry.